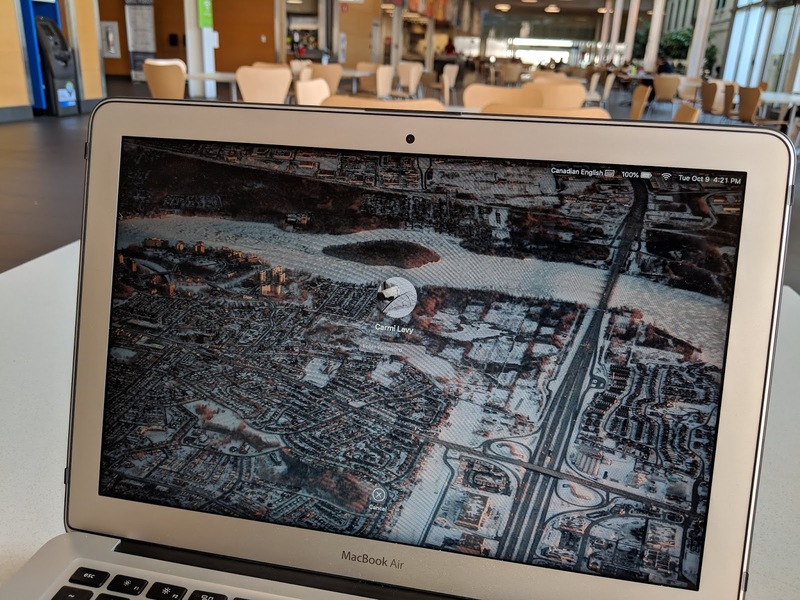 There's a fun backstory to my laptop's lock screen image. It's an aerial view of the town, Chomedey, where I grew up. I captured it a few years ago as the plane I was in was on approach. It looks south-southeast. Highway 13 is on the right, Montreal is across the river up top, and the house I grew up in is somewhere toward left-of-middle. I keep this photo front and centre on my laptop because I never want to forget where I come from, and I always want it close by no matter where I am. In this one shot, my entire early life unfolded. My wife's childhood home is out of frame, but where I met her as a doofus teenager is very much there, as are the streets we walked endlessly as we slowly figured out the universe had plans for us. The picture-of-a-picture, of my old hometown on my laptop screen in the middle of a hospital atrium, tells another story. Of being far from our now-home, navigating uncertain waters as my wife sits beside her dad's bed on the other side of this giant institution. It's a small reminder of the power of photographic touchstones to cut through the chaos and take you back to places that mattered. And still do. This photo, these places, and how and where I choose to keep them with me: they're almost like building blocks of who I am now. And as I sat in the atrium alone and pondered the meaning of the photo I had just taken, I found myself hoping all that history had prepared me for what lay elsewhere, and ahead. It'll have to be enough, because soon enough, the laptop gets put away, and real life awaits. Autumn color over St. Kevin Ave.